Cook pasta as directed on package, adding asparagus for last 2 minutes of cooking; drain. Rinse with cold water; drain. In tightly covered container, shake oil, vinegar, mustard and garlic salt. 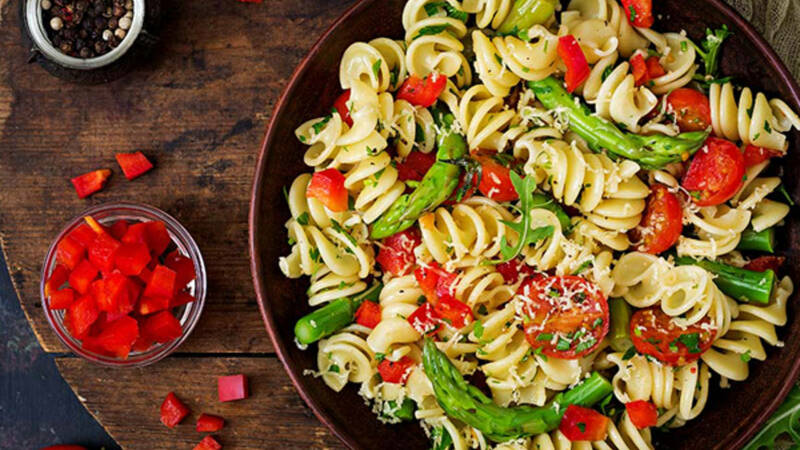 In large bowl, toss pasta, asparagus, bell pepper, tomatoes and oil mixture. Cover and refrigerate at least 30 minutes to blend flavours but no longer than 24 hours. Serve with pepper. Success If using pasta for a salad, rinse it under cold running water to remove the excess starch and to keep the pasta from sticking together.